Cool things to do in Minecraft? Build a log ride by making a canal that goes up and down and around and put water going around in it. Also, you could make a water slide that goes way in the sky above the clouds with a ladder going all the way up.Also make a small town complete with multiple roads and houses, a grocery store, a school, a church, a courthouse, and a gas station. All buildings should be able to be explored. It would be fun to make a secret tunnel underneath the town that only you know how to get to.Okay, one more idea too. Go on a server where you can do role play. This seems like it would be fun, though I haven't tried it yet. build some of that, or just join a server, get a mod, or make/play a map. Try out some of the challenges that have been made by players. These add rules, boundaries and goals that make the game feel more interesting and sometimes can even alter Minecraft to feel like a different game. You can also always try adventure maps and SMP. 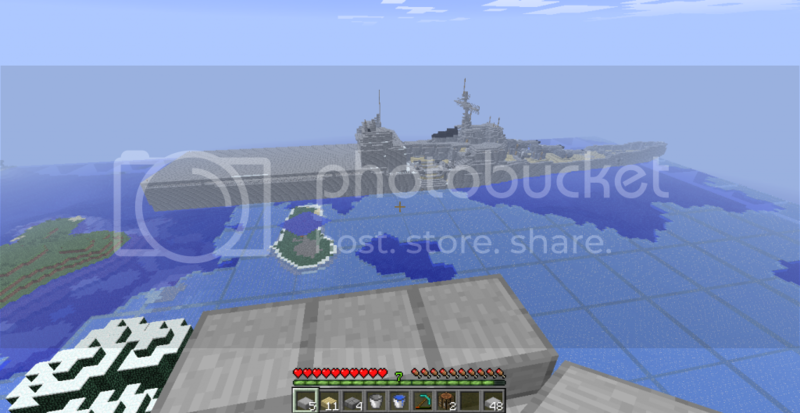 What we have here is an original concept, A battleship (was originally going to be the U.S.S Missouri) modernized and converted to be a Landing Dry-dock Ship. It is not a Battle-carrier! Interesting extra feature is that it also is a Ice Breaker. Due to the fact it is almost the same size as an Iowa class, and an Ice breaker, this ship could go almost anywhere. This one is Incomplete, At best it’s 50% done, All Survival mode, Still needs interior design, Lower hull needs to be started on, and Helicopters and Harriers need to be added to the deck. I've put close to 120hrs into this, It can hold up to 8 fully loaded LCAC Transports (need to be added) and close to 20 aircraft (need to be added). I may change the rear superstructure so It is longer but that is still up for debate. Current Armament is 8 Hi-V 10in guns arranged in duplex turrets and 8 CWIS 4 (2 normal, 4 Duplex Housing) more of which will be added. Download some mods or modpacks! I had gotten extremely bored of just regular survival mode in vanilla minecraft (I'm not much of a creative mode kind of guy) so I started playing Tekkit and YogBox! I still haven't gotten bored of them, there's plenty of them out there. Also getting texture packs provides a great new view of everything in the mincraft world, which can make the gameplay better too! I like building missiles launching platforms near bases and sending hypersonic missiles towards my enemies! Voltz is my favorite technic mod pack by far. It's simple & fun pvp. Getting in Skype and raiding with friends is the most fun I've had on Minecraft ever. If you are a Minecraft freak like me, here is the link you will thank me for. A sublime zombie shooter! Look for a nether fortress and build a cobblestone path from it to your portal. Tekkit ;D~! Bringing redstone to the very next level, the Technic packs are massively complex and there are always things to do! Look for cool mods or play multiplayer! To own a army of ocelots. A lot of these comments are about only 2 things. Mods, and multiplayer. I have a different suggestion. Go back to your very first world you ever played in. In my case, it was from 1.0.0, and when I saw all the things I had done, I got inspired again more than anything I had seen in multiplayer. I had some forge mods, and a few cool builds, and seeing them, remembering them, and how they work was a great feeling. I reflected on it. How my building styles have changed, how my mod selections had changed, and how even minecraft itself had changed. Trust me. It's a great feeling. I made my own shader pack, by the way.